It’s not everyday that I can talk about large-scale development in Chestnut Hill. The same could be said for other popular Philadelphia neighborhoods like Rittenhouse Square, Society Hill, Washington Square, etc. Why, you may ask? Well, there really isn’t any land available to develop in Chestnut Hill. The old Magarity car dealership (which for some odd reason, people ask if they are my relatives; Garrity … Magarity … anyway) has made way for a new mixed-use project in one of Philadelphia’s most established neighborhoods, Chestnut Hill. For years, BP worked with local neighborhood groups to approve a sensible project for this site; mixed-use on a busy commercial corridor. It took some time, as well as compromise from both sides, but it was officially approved about a year ago. Not only will this project add a much needed/walkable grocery option to Chestnut Hill, but it will also incorporate a residential element to the plan; currently calling for 17 condos. 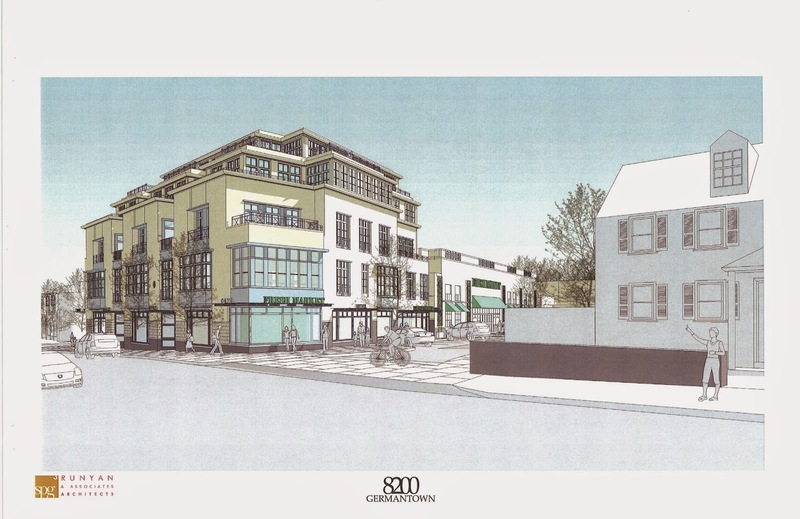 Although some local neighbors were not in agreement with the scale/density/parking/traffic, the Chestnut Hill Community Association (CHCA) helped both parties reach an agreement and is in full support of the project. “It is an important development and significant to the continuing upgrading and economic health of the avenue,” stated Will Detwiler, who is President of CHCA. Personally, I agree with Detwiler. This is a great project for Chestnut Hill. In a city like Philadelphia, with the amount of history and density we have, new construction development (whether it’s residential, commercial, or industrial) always requires a lot of due diligence. Why, you may ask? Well, there are a few reasons. First and foremost, land is scarce. Most of Philadelphia’s new development is considered dense/urban infill. Meaning that someone is building where something used to be, or someone is building in close proximity to surrounding neighbors/businesses. Philadelphia doesn’t really have huge swaths of raw land just sitting around waiting for developers to come by and buy it. Most of Philadelphia’s land (even larger parcels) has been bought many times over, been reimagined more than once, or is being prepped for the next visionary. Second, Philadelphia is a provincial town. So much so, that locals still even refer to Philadelphia as a town (like I just did myself). Generations of Philadelphians have been born here, have raised families here, and have passed on their assets/wealth to their heirs. Sometimes it’s a good thing, and sometimes not; as not everyone wants to be involved in real estate. Bottom line, there are many people in Philadelphia who are resistant to change due to our city’s storied history and localized culture. Finally, there is a major renaissance taking place in Philadelphia today. Lots of new people have moved here from all over the world, and they want to create positive change in the city; many times, through development. Real estate in Philadelphia is considered inexpensive when compared to similar metropolitan areas of both size and location (namely Boston, New York, and Washington DC). Philadelphia’s affordability and ideal location has sparked interest from global investors who may not always have the public’s best interests in mind; it’s a number-based decision for them. This has caused some neighbors to resist new development in Philadelphia. So in an established/historic neighborhood like Chestnut Hill, where there is not much land to be had for projects of this size/magnitude, it’s understandable why the local community wants to have input. As this project has shown, neighbors and developers can work together for both the pursuit of profit as well as the greater good. I look forward to seeing it completed.